George Martin Weiss was an extremely successful baseball executive - 29 seasons with the New York Yankees (1932-1960), 19 pennants, 15 World Championships, and considerable profits. 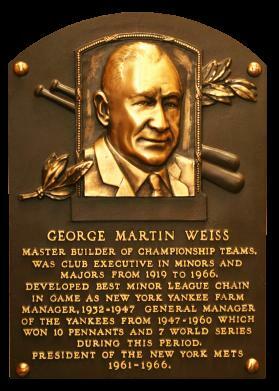 Weiss plaque, which hangs in the Baseball Hall of Fame, states, "Master Builder of Championship Teams, was club executive in minors and majors from 1919-1966. Developed best minor league chain in game as New York Yankees Farm Manager, 1932-1947. General Manager of the Yankees from 1947-1960 which won 10 pennants and 7 World Series during his period. President of the New York Mets 1961-1966." Weiss began his baseball career in New Haven by becoming New Haven's Baseball Entrepreneur while he was attending Yale. His semi-pro team outdrew the local Eastern League club. Weiss gave the fans big-name stars like Ty Cobb who demanded $350 for his first game (Weiss gave him $800) and Sunday Baseball. In 1919, Weiss bought the Eastern League club. In 1932 after joining the Yankees, Weiss built a farm system which at one time boasted more than 20 teams. In 1947, Weiss became General Manager of the Yankees with absolute authority. In 1948 when the Yankees finished in third place, Weiss fired manager Bucky Harris and hired Casey Stengel. He surrounded himself with exceptional people and a brigade of outstanding scouts. Weiss consistently strengthened the Yankees and ruled with an iron fist. In 1960, after the Yankees lost the World Series to the Pittsburgh Pirates, Weiss and Stengel were forced to retire. George Martin Weiss is resting at Evergreen.